Made of 0.8mm Synthetic Leather (Amara). 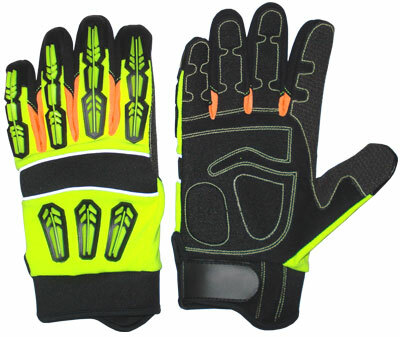 Reinforcement Palm, Middle, Ring and Little Finger with Grippe Material and Stitched with Kevlar Thread, Eva Padded. Non-Slip Kevlar Reinforced on Thumb and Saddle Finger, provides More Durability and Excellent Grip. Back Unique TPR (Rubber) Injected on Nylon Spandex Fabric, Full back of hand and finger Impact protections. Neoprene Wrist with Hook-and-loop closure provides a flexible fit for superior protection on jobs. Oil and water resistant synthetic leather Not 100%.